The Recycled Plastic Lumber Boards are available in Black, Brown, Cedar, Charcoal, Green, Sand and Weathered. The Recycled Plastic Legs are available in Black, Brown and Green. 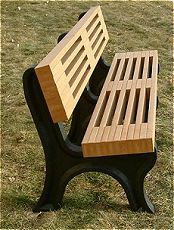 Recycled plastic lumber is a solid profile material with colorants and UV inhibitors throughout. Made using High Density Polyethylene (HDPE) from recycled milk jugs and plastic scraps, it is extremely durable, tougher than wood, non-toxic and maintenance free. Unaffected by the majority of things that plague wood, it is highly resistant to fade, check, split, or splinter, and is easy to work with using standard tools and fasteners. Recycled plastic lumber comes with a limited 15 year manufacturer's warranty. Permanent UV stabilized colors eliminates the need for painting, staining, waterproofing, stripping and resurfacing. Recycled plastic lumber is resistant to paint, ink, mildew, and other contaminants which may be removed using mild cleaners. Additional freight charges may apply on this item. We will contact you with these additional charges, and await your approval before finalizing your order. You may also email or call for a freight quotation. Be sure to specify what you wish to order, and please indicate your zip code when requesting a freight quotation. Please allow up to one business day for us to finalize your freight quotation. Our email address is sales@abundantearth.com and our toll-free telephone number is 1-888-513-2784. Please allow approximately 3 to 4 weeks for delivery. Please contact our Webmaster with any questions or comments. © Copyright 1997 - 2019 AbundantEarth.com, Inc. All rights reserved.